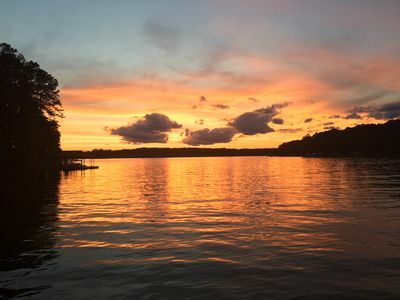 Want to enjoy some lazy days on the lake and reconnect with your loved one and your family? This is the perfect place just for that. 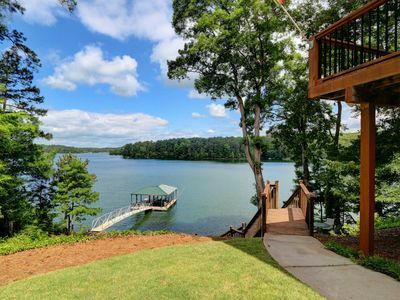 Enjoy your days on beautiful Lake Allatoona. You will have your own private dock for relaxing in the sun, fishing, and docking your boat in the peaceful cove. Enjoy the wildlife around you as you get back to nature when you see the water birds and the friendly deer that make daily appearances. You are greeted as you walk up by the screened in rocking chair front porch and patio. You are invited into the spacious open great room with gas fireplace that opens up to both the front and back screened porches. Fully stocked open kitchen to enjoy cooking your meals together. The back screened in deck with separate grilling deck overlooking the lake is perfect for gathering and reconnecting with friends and family. End your day in the comfortable bedroom that envelopes you as you enjoy a good nights sleep. The sofa in the great room opens to a queen sized bed as well. 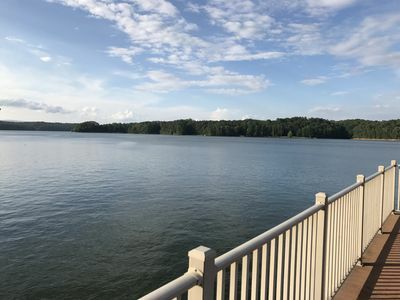 If you don't have your own water craft, Lake Allatoona Boat Rentals at Park Marina has a variety of boats and wave runners available for rental. 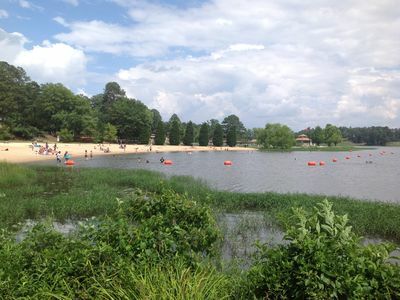 **Lake is at full pool Memorial Day through Labor Day** Location: 8 miles from exit 290 on Hwy 75, 15 miles from Lake Point Sports Complex, 12 miles from shopping and dining in Cartersville, 17 miles from shopping and dining in Canton. Lake Cabin offering swimming, fishing and picnicking. Enjoy the comforts of home wuth fully stocked kitchen. Table in yard to enjoy the view. Large open area with TV. One small bedroom with full bed with TV, digital TV and DVD player. Blow up mattress available in large living room. . A walk in shower. Washer and dryer available for your convenience. Cabin situated at the base of Red top mountain state park for your enjoyment. 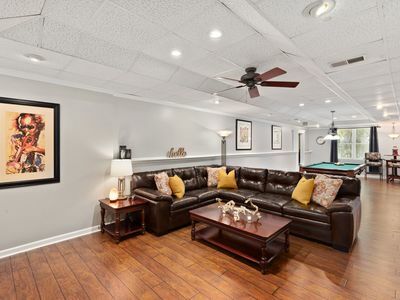 Cozy studio in daylight-walkout basement, perfect for a baseball family. Private entrance, full kitchen, private bath, patio, pet friendly, fenced yard. One full bed and one pull out queen size, toddler bed available. Steps to the beach, playground, and walking trails. Walk to great dining, live entertainment Friday and Saturday nights, and quaint shopping in historic downtown Acworth. Five minutes to LakePoint Sports Complex-wake-boarding up and running! Thirty minutes to Atlanta-Aquarium, World of Coke, Zoo, CNN building, Braves, and much more. Stone Mountain 45 minutes away. Hiking at Kennesaw Mountain fifteen minutes away. 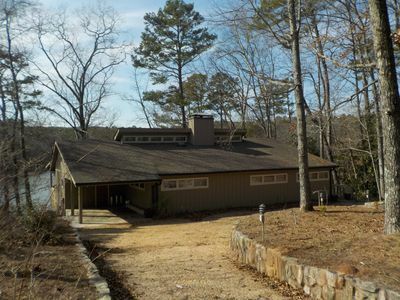 Cute little cabin located on Lake Allatoona with private dock. One bedroom with queen bed, bunk area with 5 twin beds, and full size bed in loft. Huge porch overlooking the water. Equipped with washer and dryer. Kayaks, canoe, and paddle board available for use. Renters must supply life vests. Bring your boat or rent one from nearby marinas! Very private and peaceful location. 7 miles from Lakepoint Sports Complex. 4.5 miles from the interstate. 30 miles from Mercedes Benz Stadium! 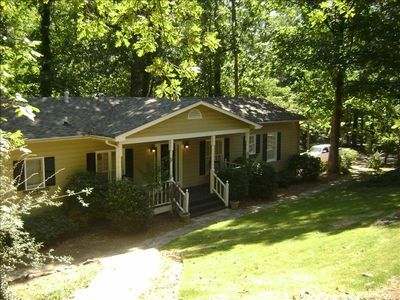 The Little White House on Lake Allatoona is a charming, lake cottage that sleeps 8. The house has a fully equipped kitchen and ensuite master bathroom. 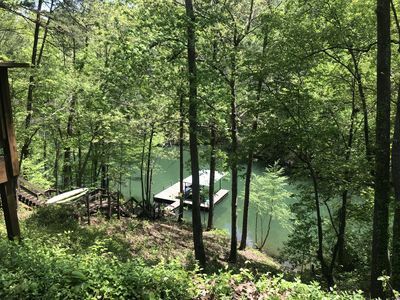 It is located on a wooded lot with a short stroll to a dock on a no wake cove (ours is a gentle slope to dock - many houses on Altoona have extreme walks and many steep steps to the water). Spend the day taking advantage of lake activities like fishing, floating, kayaking or rent a boat at the local marina. In the evening enjoy the amazing sunsets from the top of the dock or the stone patio. The house is located just outside of Red Top Mountain State Park if you want to hike one of the park's many trails. If you are looking for shopping or dining you are just 4.4 miles from downtown Acworth & 11.8 miles from downtown Cartersville. Lake Point Sports complex is 7.9 miles away. Not many lake locations offer so many amenities within such close proximity. All of the bedrooms are upstairs and the lower level of the house has a kitchen, dining room, living room and family room with water views and a walk out patio. During your search please note you can end up very far away if you book properties on other lakes and many ballgames are even played south of Lakepoint during tournaments making the drive from other lakes hours to the games. 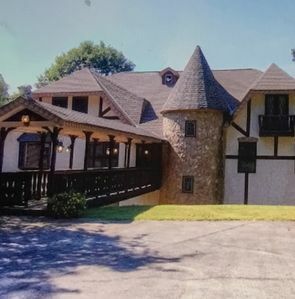 This property sits off of a gravel road on three acres. There are five bedrooms with six queen beds and one king. The house has three levels with the kitchen, dining room and living room on the middle level. The kitchen has granite counter tops, with an island cooktop. All appliances are stainless steel. The upper and middle level has hardwood flooring. The bottom level is covered in tile and carpet. The master bedroom is on the middle level and it has a private shower and jacuzzi tub. The upper screened in porch is accessible from the master bath and the kitchen. On the bottom level there are two bedrooms, a movie room with theater seating ,a bar and another screened in porch. The top level has the two remaining bedrooms. There is a huge front yard for all sorts of activities and an oversized bbq grill. There is a 750 sq ft gym/workout facility located on the property grounds. 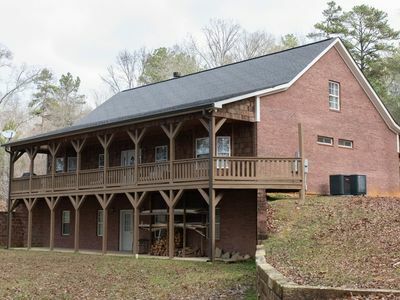 The property is located less than a mile from Lake Allatoona and Redtop Mountain. Lake point sports complex is about 10 min away. Harstfied Int airport is about 45 min away. Downtown Atlanta is about 20-25 min. This property is great for family functions, such as family reunions. The wooded area is great for camping out. If your traveling with a large group, plenty of parking is available. There are several cameras monitoring the area, as well as an alarm system. Private suite in a beautiful stone accent home. 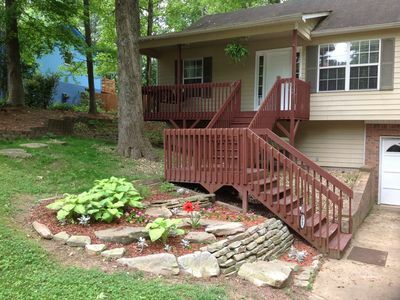 Enjoy a walk to lake or Hobgood Park in minutes. Full access to kitchen, shower room, living room, shared laundry room, free WI-FI and parking. Continental breakfast included Tea, hot chocolate and coffee are always available. Easy access to both 575 interstate and 75 Interstate. Miles to Historic Downtown of Woodstock, few miles to the outlet stores, 30 miles to downtown Atlanta and 40 miles to the Hartsfield- Jackson Atlanta Airport More information Comfortable laptop desk for business and professional individuals. A few miles to downtown Woodstock, concerts, shopping, restaurants, pubs, hiking and bike trails, Cherokee Aquatic Center, outlet mall, Lake Allatoona, Kennesaw Mountain and lots more. SHOPPING Publix Walmart Supercenter Kroger Aldo Nature's Corner Market - Woodstock RESTAURANTS Tacos EL Sabor Chick-fil-A Towne Lake Guest access The guests will be provided with smart lock code before their arrival. Other things to note The parking entrance is monitored by external camera. 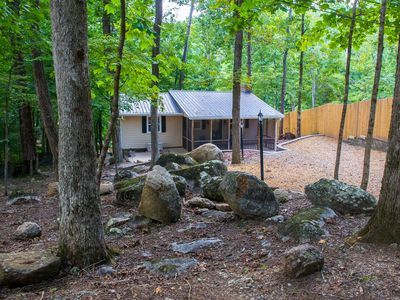 4 Bedroom, 2 Bath home, nestled in the foothills of the Appalacian mountains. 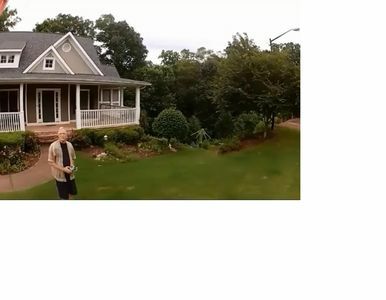 Home is located in a safe and well established neighborhood in Canton Georgia. 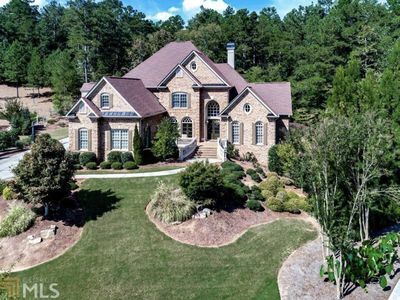 Home is located 20 minutes from I-75, 3 miles from I-575, 5 minutes from downtown Canton, 4.5 miles from Lake Allatoona, 25 minutes from Lakepoint Sports Complex, 16 miles from Downtown Woodstock, and less than a hours drive from Atlanta. 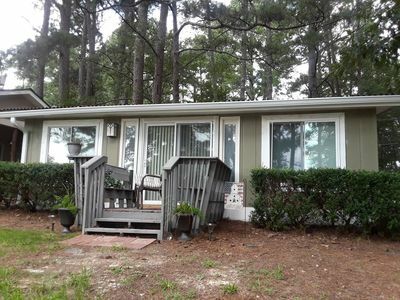 Home sits on a nice one acre lot wooded lot. Back yard features a LARGE deck, playset for the kids, and plenty of room to run around and play. Great location for competing fishermen or boaters. Cherokee Mills Park boat ramp is only 4.5 miles down the road. Driveway is large enough to park 2 boats and two towing vehicles. The closest beach is less than a 10 minute drive from the house. Newly renovated space with fully stocked kitchen. Everything you will need to feel right at home. Breakfast bar seats four. Comfy gathering space with seating for four plus and large flat screen TV. Sleeping for four with Queen separated by floating wall and super comfy queen pullouts. One bath with walk in shower and spacious vanity. Quiet backyard space with gas grill, fire pit, and seating for twelve. Three bedroom/two bath space in quiet neighborhood. Upper level of two unit home. This space is completely separate from lower unit. Master bedroom with large walk-in closet closet, sitting area and laundry. Master bath boasts separate shower, large two sink vanity, and garden tub. Split floor plan, fully stocked kitchen with island, family dining area seats eight. 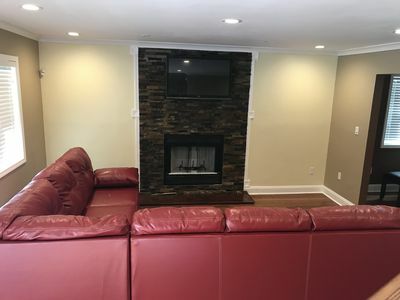 Large bright family room with fireplace, large screen TV, and comfortable seating. Deck off dinning area. Shaded backyard with large gas grill, picnic area, fire pit and casual seating for all. SUPER BOWL COUNTRY CLUB MANSION AVAILABLE $8000 Wed-Mon stay 2 rounds of golf for 4 players at championship Governors Towne Club course 35 minute drive to stadium Black Car service to and from airport and all SB events also available on request. Short drive to Atlanta. Large home that will accommodate your entire family or friends. Nice outdoor fireplace on large back patio, as well as two inside. Large entertainment center with huge flat screen TV and a pool table that will accommodate everyone. The gourmet kitchen will make it easy to prepare your pre-game meals. Located in the cul de sac. Three car garage makes it easy for parking with a large amount of guests. Large and spacious rustic style home. Sits on 1 acre and over 200 feet off the road for privacy. Has a large front yard that is great for outdoor games. 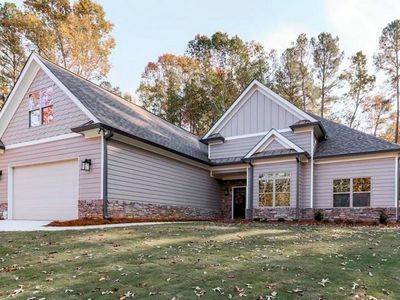 It is only 3/4 of a mile from LakePoint Sports Complex and one exit away from Lake Allatoona and Red Top Mountain State Park. Great place for families to stay when visiting and playing at LakePoint. There are 3 bedrooms on the first floor and each of them have them own full bathroom with walk-in closet. There is also a half bath on the first floor. 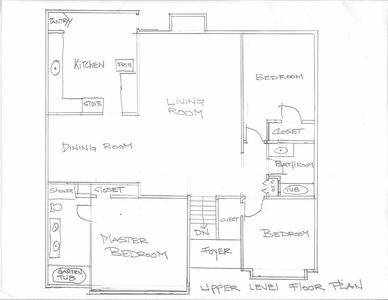 The second floor includes two bedrooms with closets, living space with TV and fireplace, and a one full bathroom. Large spacious Open areas with entire home built out of only Hardwoods, Stone, Brick and real stucco with no dry walls in entire place. Looks like a Castle and was built in 1982 by a NASA Engineer and designed As a Eurpoean Castle. It has a large bedroom with a queen size bed on the main floor and it is handicap accessible with an easy roll on covered walkway, upstairs there is a large bedroom with 3 single beds and a full private bath, also upstairs is 1 smaller bedroom with a single bed in it and a large bathroom with a huge shower with multiple shower heads, and finally upstairs there is a huge master suite complete with queen size bed, beautiful couch, chair and large ottoman, large closet with stairway off of it up to the Prayer room, and off of bedroom is a small private screened deck, the huge master bathroom off of this master suite has a large shower and a separate jacuzzi bathtub, closed water closet,double sinks and a small Romeo and Juliet balcony off of it. The main floor has a huge great room, another full bathroom, a large gourmet kitchen with a commercial grade gas oven, and microwave, dishwasher and large refrigerator, there is a deck off of the area between kitchen and great room, off of the great room, there is an all glass enclosed sunroom with a dining room table for 12 and space for another dining room table of equal size or owners have used it for a place to put down yoga mats and stretch with a view over the mountains. There is a separate deck off of this sunroom. There is a full size washer and dryer on the main floor and laundry shoot from second level for sending laundry on down next to W/D. There is a room with an infrared sauna, however, it can NOT be used due to insurance coverage by guests staying sorry for inability to use it. The basement includes a heart shaped labyrinth one can walk for relaxation, an area with couch and bookshelves for lounging and huge storage workbench area and what used to be a wine tasting wine cellar room.. All areas accessible to you except the infrared sauna due to insurance as stated above. Also, the 2 car garage is being used for storage and the 2 locked doors at end of hallway upstairs are 2 small areas being used for owner/storage, there is paved parking out front for 15-20 plus cars. Amazing views off the large back decks and the huge sunroom/dining private with no other homes within sight of this home, with its own gate, and yet less than 4 miles from Lake Point, and grocery stores and all you would need for your stay, and since it is out in nature, one may see occasional insects and the most frequent visitors are the ladybugs certain times of the year and it is to be expected in a private wooded area.You can even drive to Atlanta and Buckhead areas within 40 minutes for all the Atlanta attractions, fine dining and excitement of Hotlanta while staying in the most serene, peaceful and beautiful Castle thus the name “Serenity” where you can have the best of all worlds. 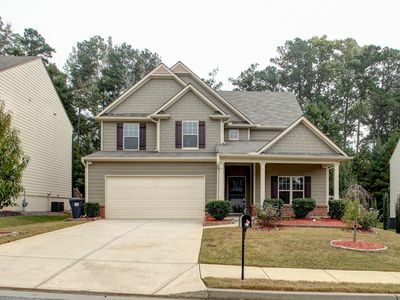 *NO PARTIES* Near Kennesaw State University, Lake Acworth, sports complex, parks, shopping and more! Everything you need is within 10-20 minutes. The new Braves Stadium is about 25 minutes away. Beautiful huge park less than 2 miles away with a brand new skate park! Very quiet, small neighborhood. Literally, it’s 4 streets! Entire home is available except the master bed/bath which is locked. Host may or may not be on site being 99.9% not :) House has recently gone through upgrades so you do not want to miss out! The best compliment is a review. Thanks and enjoy the space! 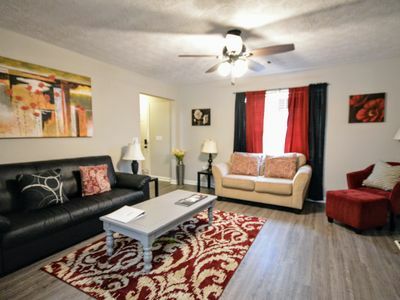 My place is a one bedroom luxury suite (lower level) in a quiet secluded neighborhood that is safe for walking, 5 minutes to I-575, 10 minutes to the Shoppes of Atlanta outlet mall and only 30 minutes to the new Sun Trust Atlanta Braves stadium. 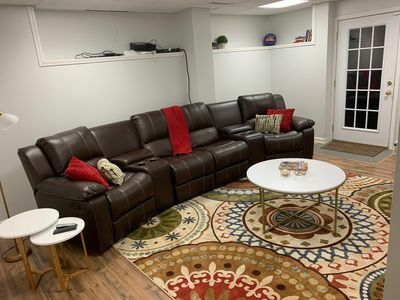 The suite is spacious with over 1400 SF of living area, fully equipped kitchen, full bath, media room with pool table, TV, Netflix, Wi-Fi, workout room, maximum privacy and more. In addition, the suite has a private entrance! You will be able to access the lower level only. There is a private walkway from the driveway to the private entrance which is secured by a smart lock/code. Please be aware the walkway has a slope as shown in the photo. Those with mobility limitations may have a challenge coming up and down the walkway. My home is close to Marietta, Kennesaw, Roswell, and Woodstock. Downtown Atlanta is a short 45 minute drive. 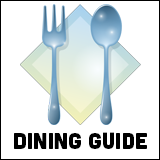 In addition to the Shoppes of Atlanta outlet mall, there is a wide variety of restaurants in the area and Lake Allatoona is approximately 5 miles away. Please review the house rules before booking. Cozy Corner Exhale, and Enjoy your Vacay :-)! A House That Has It All. (ONLY $3000.00 NIGHTLY).. 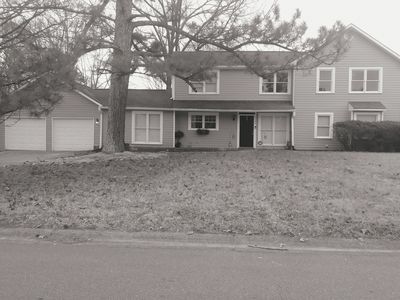 The Studio: We have a basement studio in a private home located in White, GA. The place is set up for two adults. Great to relax, in a quiet neighborhood, private entrance, bright studio, covered fence backyard for our guests to relax and their fur babies. 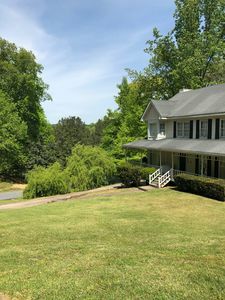 10 min to restaurants, shopping area, movie theater, downtown Cartersville, also nearby Allatoona lake, biking, running, nature trails, Lake Point Sports recreational complex short drive away. 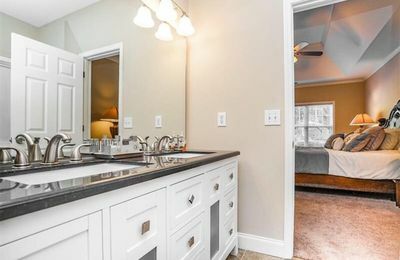 35 to 45 min to Atlanta (no tolls) and many other destinations Gateway to N. Georgia; Small Basement Studio - Complete with Kitchenette, Bath and Private Entrance. Guest access: Guests have access to: Queen Size Bed w/ Linens, Pillows, Extra Blankets Kitchen: Fridge; Microwave. Coffe maker, Electric Double Burner Hot Plate Portable Stove Heater Countertop Please enjoy the comforts of our home. Iron Sofa (not a hide-bed), T.V, Net Flix Bath Room: Private Bath. shower Parking - Safe secure neighborhood private entrance. Interaction with guests We live upstairs. In case of an emergency our preferred method is text. Other things no Smoking inside. Smoking Area Outside of Studio. 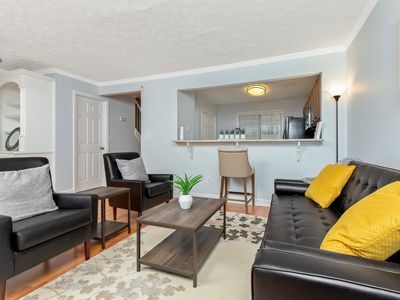 Cute spacious one bedroom basement apartment with private entrance in a family neighborhood. 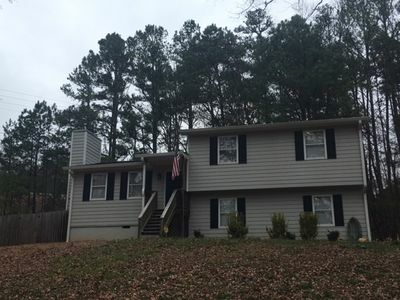 This house is located in the prime Towne Lake area in Woodstock with walking distance to stores, and restaurants, and 3 miles from downtown Woodstock. 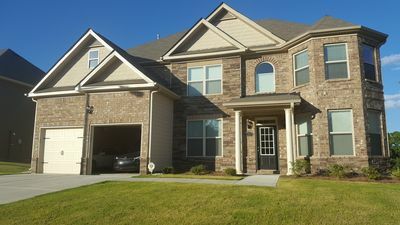 It is also only 2 miles from the major hwy 575 and 3 miles from The Outlet Shoppes at Atlanta. This is a one bedroom apt with living room, mini kitchen (mini refrigerator, microwave, coffee machine and sink), and bedroom with a comfortable queen size bed. In the living room we have a movie projector connected to the xfinity cable to give you access to several tb channels through the large projector image. You will have access to the entire basement apartment through a private entrance on the side of the house. 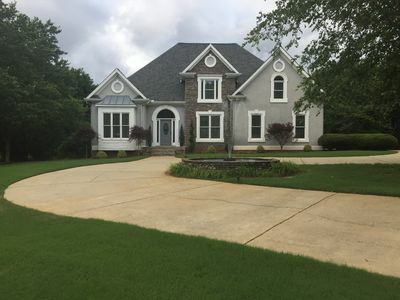 Property was built in 2015; Located in an HOA community with clubhouse, pool, tennis courts, and playground; This home features 5 bedrooms, 4 baths, Living room, Dining room, Kitchen with center island w/bar stools, sitting area off kitchen w/dining options, family room, 2-car garage, and patio on rear of house; 2 bedrooms are furnished but the remaining 3 BR are empty; Easily accessible to Town Center Mall shopping, Outlet malls, Grocery stores, Lake activities, Six Flags Parks, State Parks, Dobbins Air Force Base, The North Georgia Mountains, and Metropolitan Atlanta, Ga. 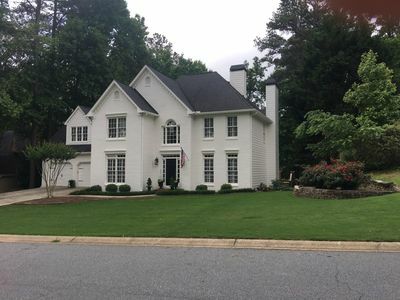 Cozy 2,900 square foot family home nestled in a community 25 miles from Mercedes Benz Stadium. Perfect for those who are ready to be in the game but can detach and relax at any time. Plenty of amenities to include free WIFI, flat screen TVs in the Master Bedroom and Living Room, Spa Tub, our door Jacuzzi, a fire place and few other things here and there. King size bed in the Master, queen size bed in one room, twin in another, and a pull out couch in a play room perfect for kids. 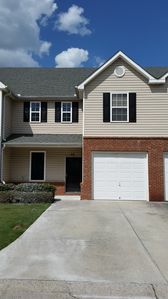 Sprall out in this 3 bedroom, 3.5 bath townhome that is just 11 minutes (9.6 miles) away from Lakepoint Sports Complex. This townhome sleeps up to 8. Each bedroom has its own private bath and walk-in closet. The upstairs loft can be used as a second living room or play area for the kids. The sofa in loft is a Queen sleeper sofa. The fully equipped kitchen features an open concept and seats 6. Off the living room is a private patio complete with grill. The community also offers a pool and play area for your enjoyment. A small fishing pond is across from the community. Wireless internet and cable are provided. Gorgeous, oversized, two story home in an upscale neighborhood.Accommodates everything from couples, to large families, groups & even the family pet with an awesome fenced-in back yard with a patio. Massive master, spacious secondary rooms. This home has it all. 5 minutes to the interstate & to KSU. The pictures truly represent the place! Worth 1,000 words. Relaxing, Comfortable. Spacious. Neighborhood Swimming Pool and tennis court Master Bedroom - KING size bed Bedrooms 2, 3, 4 = Queen bed Bedroom 5 = Full size bed Gel foam mattresses on all beds Smart TVs. WiFi access. Oversized master with separate tub and separate shower. Over 2,000 square feet. The home includes all the conveniences of living at home with the "at home" feeling. 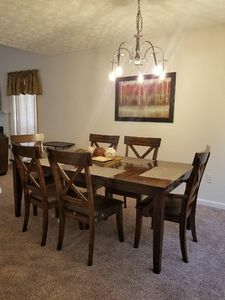 * Full Kitchen utensils and cookware * Includes all pots, pans, *Coffee maker (Kurig) This house is conveniently located off Exit 273 Interstate 75. Less than 2 miles from the interstate 75. (two turns and you are on the interstate!! TVs located in living room and bedrooms. We provide wi-fi access and cable TV is provided through streaming channels (but not guaranteed if technical issues are required). We use Roku TVs so you may stream other services. Where is home located? How far are the activities? All the times are given with map software during non-rush hour. Interstate 75 (exit 273) 2 minutes Atlanta Braves - The Battery - 12 minutes! Awesome venue! Enjoy even during non-baseball times! Downtown/Midtown Atlanta - 24 minutes Mercedes Benz Stadium - Falcons/United - 29 minutes Cumberland Mall - 11 minutes Atlanta Airport - 38 minutes Cobb Galleria - 18 minutes Lakepoint Sports Complex - 15 minutes Georgia World Congress Center - 35 minutes No partying. If your intention is to party, respectfully, move on to the next house. We want guest that appreciate a good, clean place to stay and we want to provide that to them. We will strictly enforce the no partying. We respect our neighbors and want to be good steward’s of the neighborhood. 4 car limit at house. No street parking. Charming 4 bedroom home with 2 bedrooms on the lower level. Master with a queen 4 poster bed. Second bedroom twin bed. Lower level has garden tub and two half baths. Fully stocked kitchen with stainless steel appliances and double convection oven. Kitchen table seats 6 and a bar can seat 3 additional if needed. French doors open off the kitchen to a large deck with a fenced in yard. Upstairs is being remodeled but availalble with a twin bed in one room and queen blow up mattress on a futon mattress lin the 4th bedroom. There is a full bath with tub and shower. Welcome to our Cozy Southern Home where you will feel at home...we love hosting Nice Humans! We hope you come and enjoy our charming traditional country style home where the hills, and views are relaxing and calming, yet close enough to the city happenings! We are in the suburbs just 25 minutes from downtown Atlanta in Cobb County close to the all major interstates. Our wrap around porch allows guests to enjoy the Southern Scenery in any weather! We look forward to seeing ya'll! Upon arriving we look forward to hopefully meeting and greeting you with a hearty Southern Style HELLO....after your long travels! We will leave leave plenty of space for you to come and go as you please without hassle. We offer two clean and spacious rooms for guest stay in a shared home with other professional quiet working adults. Each room is listed separately so book accordingly. 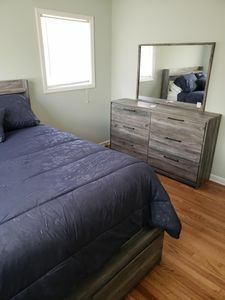 One master suite with private bathroom and can hold 3-4 (2 guests are included - after 2nd guest additional) The second room fits 2 guests and is a private comfy room with a shared clean bathroom. Both rooms have privacy locks and if additional guests are needed we can accommodate at additional rate and use air beds with prior request. Quiet hardworking professional adults share private rooms at our bed and breakfast. We have hosted many international professionals and students and enjoy hosting! Breakfast is provided upon request! 2 large private rooms avail, one master suite with a bathroom and the other is one large bedroom with a shared hall bath. Please see the bookings for either room and choose accordingly! Plenty of seating and space to relax and unwind in and outside the home. For the busy traveler we offer on site: daily maid service, meals and spa services at a small additional cost, please ask. We have tons of outdoor and indoor space to relax, unwind, mingle, work, play, read a book, enjoy nature and the views, take a walk or run, listen to music or just chill out. We have an outdoor trampoline, basketball court, pool and tennis courts, and indoor basketball arcade hoop, tons of board games, cards and dominos are accessible! Come check out our lovely home in the suburbs! We also can provide a wonderful holistic massage or chiro and yoga or acqupuncture sessions to refresh your long travels - Pre booking most likely needed. Take the hassle from the Atlanta nightmare traffic! We offer quick affordable and efficient personal driving and transportation services for your stay if pre booked! We would love to help your stay in providing quality services at a fraction of the cost of rentals and other driving services. Pre-book with us and let us service your needs! We look forward to hosting your stay while in Atlanta! Gorgeous, oversized, two story home in an upscale neighborhood.Accommodates everything from couples, to large families, groups & even the family pet with an awesome fenced-in back yard with a patio. 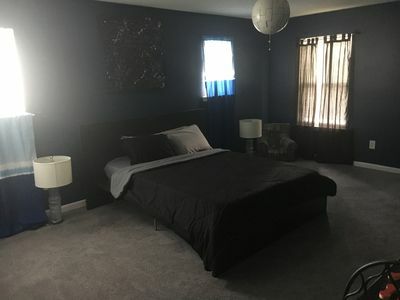 Massive master, spacious secondary rooms. This home has it all. Welcome to your home away from home!! Convenient - 5 minutes to the interstate & to KSU. 15 minutes to Lakepoint Sports Commuity & about 20 minutes to downtown. Amazing home, Amazing location & Amazing value!!! The space: The pictures truly represent the place! Worth 1,000 words. Relaxing, Comfortable. Spacious. Gel foam mattresses. Queen beds in all the bedrooms. Smart TVs. WiFi access. Oversized master with separate tub and separate shower. Over 2,000 square feet. Guest access: You have the entire house for your stay. We set up the house with expectation of what we like to see - comfortable beds being the number one priority. We have included extras to get your stay off to the right start - laundry pods, soap, shampoo, conditioner etc. The kitchen has dishes and cooking equipment for those that want a home cooked meal. We do an excellent job communicating and hope that your stay will be enjoyed without any issues, but we are just a message away if there is any questions about anything. Like our properties? We have others. Our listing numbers are: 1420844 1260471 1285199 1285031 1455391 1285004 1443493 1236843 1237499 1412825 PARTYING. This is NOT a party house. This is a large spacious home. It's great for large business groups, family and friends. However, we are not looking for groups whose true intent is to "party" in the house. We want the next guest to have a nice home for their enjoyment and we also want to be good neighbors to those around the home and for the neighborhood. So, RESPECTFULLY, if you are looking for a party house, please move on to the next house. While covered in the rules, I wanted to highlight some simple rules out of respect for the neighbors and neighborhood. While we have already covered the "no partying", we also limit the cars to four cars to prevent any type of partying or more guest than what is allowed. 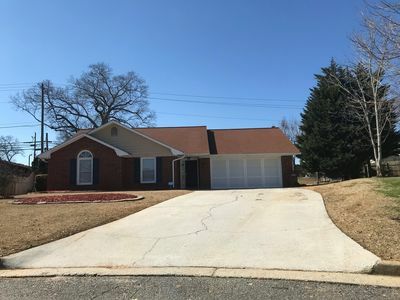 3 Bedroom, 2 Bath beautifully renovated stepless ranch home in a quiet and safe neighborhood located close to the center city of Cartersville. Open floor plan with comfortable living room, large fully equipped kitchen and dining area. Home has high speed wireless internet service with free Wi-Fi and Cable TV. Each of the three bedrooms have a queen bed. Back patio has gas grill and seating area. Large fenced in back yard for playing and tossing the ball during the day and a fire pit for relaxing in the evenings. Only 8 miles to Lake Point. All guests get free complimentary use of Floyd Landing on the Etowah River with kayaking and tubing available from Euharlee Outfitters. 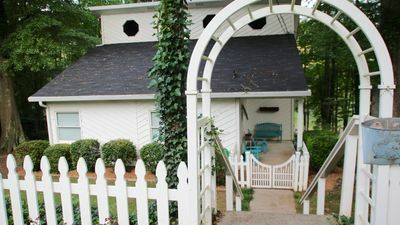 Quaint cottage style home in northwest Georgia. Cartersville Be charmed Be prosperous Belong is our city's motto. 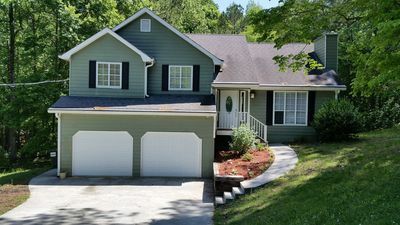 The home is only a couple of miles from downtown Cartersville, 15 minutes to lake Allatoona, 30 minute ride to Rome, GA and many more places. If you like to hike we have lots of great trials in the area. You can have a quite romantic weekend or you can bring the entire family this home is perfect for either. Book your stay and come see why we love it here! I look forward to being your host! 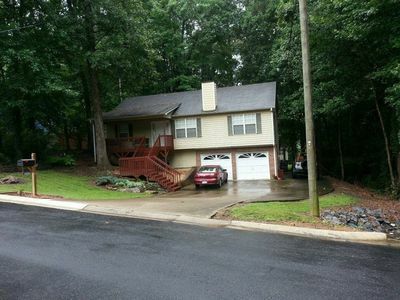 Centrally located in North Atlanta, 1/2 hour from Lakepoint Sports Complex. Guests are sure to enjoy a memorable vacation in this fully furnished, 3 bedroom, 2 and a half bath, very spacious home. The master suite is on the main floor with large walk in shower and laundry room. 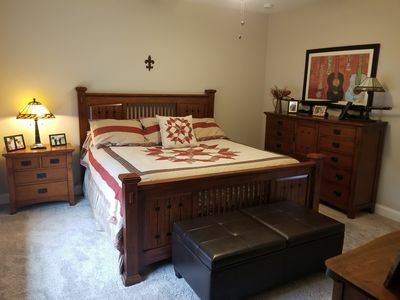 The master bedroom has a queen bed, while two, extra-large upstairs rooms are furnished with 4 queen beds, comfortable for sleeping +10 people with plenty of room for air mattresses if needed. There is a spacious formal dining room, breakfast room, living room w/ fireplace, and entertainment den. The kitchen is perfect for preparing large meals. There’s a large covered porch overlooking the pool area with a charcoal grill as well as an electric smoker for smoked meat enthusiasts. Situated on 2 1/2 acres of private beauty, guests can enjoy the pool as well as outdoor sports such as football, basketball, baseball, or neighborhood fishing. 30 minutes to an hour from most Atlanta attractions, spend the day away enjoying our 7 nearby wineries and many parks and hiking trails. Or take a short scenic drive to nearby Taccoa River (world class trout fishing); the Blue Ridge Scenic Mountain Railroad; or the Appalachian Trail located at our truly amazing Amicalola Falls. Plan lunch in scenic downtown Blue Ridge, or at the Toccoa Riverside Restaurant. On the way home, plan an amazing dinner at "Home Restaurant" for delicious farm-to-table creative cuisine (opens at 5pm). Spend evenings relaxing and enjoying family in our quite, country neighborhood. With lots of space for parking, this setting is ideal setting for retreats, corporate meetings, and sport teams. Please read through my description and message me before sending a reservation request. I do not accept reservations without making sure this is a good fit for both parties, thanks. Please keep in mind Cobb county noise ordinances will be enforced! Groups wanting to have late nights outside, or play loud music, or music with explicit lyrics, will need to look elsewhere. This property is in a conservative, very quiet area. It is intended for families, work groups, baseball teams, or responsible friends. The home is not intended for birthday weekends for groups under the age of 30, sorry. This house has it all! I have beautiful, comfortable rooms for you to get away and relax. This is a great home for families to spend quality time together. Kennesaw Mountain is a few miles away for you to hike, and it is just 25 miles outside Atlanta. 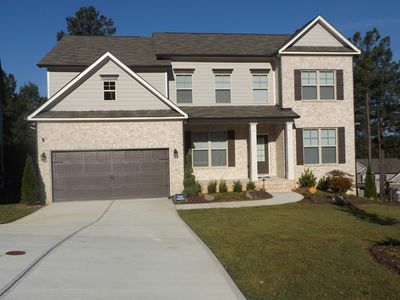 The home is also just 15 miles away from the brand new Atlanta Braves stadium! You can enjoy an evening out on the deck, watch tv or movies in every room, or cool off this summer in the well maintained salt water pool. 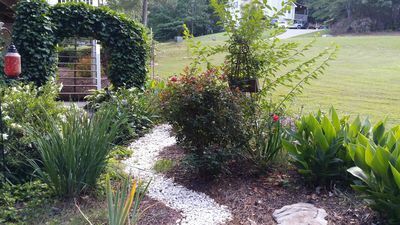 This home is on two acres and is peaceful and quiet. It is just a few miles away from major shopping and restaurants on Cobb Parkway and Dallas Highway. You can hike Kennesaw Mountain, or explore the trail system the park offers. For those of you involved in tournaments at LakePoint in Emerson, this property is just 12 mile south of that huge sports complex. It's really in a wonderful location for a weekend getaway. It has a gorgeous salt water pool, a beautiful deck set up, and a covered patio area, all for you to enjoy during your stay here. The house now has a 5th queen bed in the office if you need it. If you still need additional beds, I can provide an elevated air mattress for the bedroom. Please let me know if there's anything else I can do for you! You will have full access to this home minus the basement. I have a garage you can use, and plenty of additional parking on the driveway as well. Guests will also be provided with all kinds of extra perks along the way. The game room is filled with a bubble dome hockey game, a Captain America and the Avengers arcade game, a PS4 with several new games, an original Nintendo, and even a candy machine! Luxurious bedding, quality toiletries, and a Keurig coffee maker with hot beverage selection is all included. Of course there is Wi-Fi access throughout the home, and every room is equipped with smart TV with Netflix access and DirecTv. The Wi-Fi also extends out to the pool for your convenience. I really have gone out of my way to make sure you enjoy your experience at Naples View. Please note that after 6 guests, a $25 fee per person (per night) will be applied to the cost of the rental from October-February. From March-September The $25 fee per person (per night) will be applied for any guests over 8. Either myself, or my property caretaker, will greet you upon your arrival and walk you through the home answering any questions you may have. During your stay we are available via text if you need help with anything in the home, or in nearby Kennesaw, Marietta, or Acworth. Please be aware the caretaker will be staying in the separate basement in law suite. It has its own entrance with different locks, its own garage, and its own kitchen and laundry room. You may see him out walking the dog, or doing pool maintenance, but other than that, you won't even know he is on the property. This home is on a quiet street with only 10 other homes. While you have a lot of privacy, I do ask that you be courteous to the neighbors in the area. Smoking is allowed outside, but not inside the home. Pets are ok, but will need to be cleared through me first. There will be an additional $100 fee per pet due at check-in. No stiletto heels or cleats may be worn inside the house. Check in is anytime after 3:00, and check out is by 11:00. I do not offer early check in times, and you must be out by 11:00. Sometimes I have people checking out and checking in the same day, so I must be firm with these times. A fine of $30 every 30 minutes will be assessed after 11:00. I want you have fun and enjoy yourself in this home. I don't have many rules, but the few rules I do have, I expect you to follow. Please note that the number of people you book, is the number of people allowed on the property. If you would like to invite additional people over during the day, you will need to run it by me ahead of time. This is a very nice home, and I welcome families and groups of friends, but not for large parties, especially in the pool. The house limit is now 15 people, because of damage and noise complaints that have been caused by previous large groups. The caretaker on site will be able to keep track of numbers, and groups caught breaking this rule will be asked to leave and forfeit their deposit. If the police are called to the property because of a noise compliant, you will also be asked to leave and forfeit your deposit. Location! Location! Location!! and a comfortable, clean home! JUST LISTED!! After visiting the family, friends, seeing the sites of the area or from business, come home to a comfortable place to relax. Newly renovated. Minutes from the interstate for easy access to the city. Within 3 miles is a major shopping area that includes the Town Center Mall business district. Be at the The Battery, (the new Braves stadium) within 15 minutes. The Battery is only 6 exists away! Be down in 25 minutes! 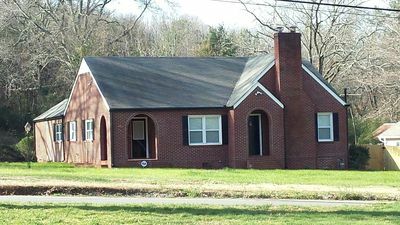 3 bedroom house plus additional studio basement apartment! PARTYING. This is NOT a party house. This is a large spacious home. It's great for large business groups, family and friends. However, we are not looking for groups whose true intent is to "party" in the house. We want the next guest to have a nice home for their enjoyment and we also want to be good neighbors to those around the home and for the neighborhood. So, RESPECTFULLY, if you are looking for a party house, please move on to the next house. While covered in the rules, I wanted to highlight some simple rules out of respect for the neighbors and neighborhood. While we have already covered the "no partying", we also limit the cars to four cars to prevent any type of partying or more guest than what is allowed. The bed make up? 2nd floor Master - queen bed 2nd floor bedroom 1 - double bed 2nd floor bedroom 2 - double bed basement studio - queen bed, also has sofa and TV in this room with additional rear access. Living room sofa - sleeps one Basement couch - sleeps one Basement futon - sleeps two Close proximity to: Braves stadium and The Battery - 12 minutes LakePointe Sports Complex - 14 minutes TownCenter Mall Business Area - 5 minutes Kennessw State University - 4 minutes Downtown Atlanta - 21 minutes Cumberland Mall Area - 14 minutes Mercedes Benz Stadium -23 minutes Interstate 75 exit Wade Green - 0.5 miles! Just renovated! New to the market after getting the upgrades it deserves. Fiber optic speed internet with unlimited data. Ruko/smart televisions. YoutubeTV provided. Conveniently located near the Interstate! 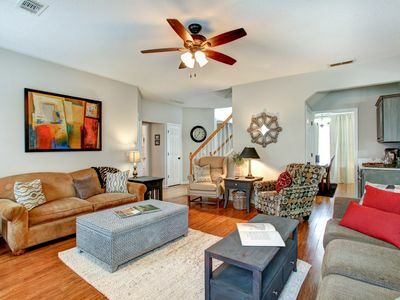 Quick access to downtown Woodstock, Kennesaw and Marietta. This is the ENTIRE HOME. NO HOUSE SHARING. Why stay with someone else when you can have the entire home! This home excels at technology, convenience and comfort. 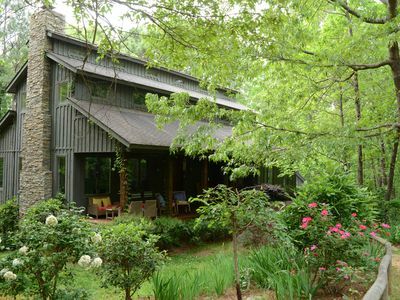 This home is a 2.3 miles to Downtown Woodstock. 12.2 miles to Downtown Marietta 18.2 miles to The Battery (New Braves Stadium) 14.1 miles to Kennesaw State University 28.5 miles to Mercedes Benz Stadium (Falcons and United) 39.2 miles to Atlanta Airport (Hartsfield) PARTYING. This is NOT a party house. This is a large spacious home. It's great for large business groups, family and friends. However, we are not looking for groups whose true intent is to "party" in the house. We want the next guest to have a nice home for their enjoyment and we also want to be good neighbors to those around the home and for the neighborhood. So, RESPECTFULLY, if you are looking for a party house, please move on to the next house. While covered in the rules, I wanted to highlight some simple rules out of respect for the neighbors and neighborhood. While we have already covered the "no partying", we also limit the cars to four cars (without permission prior to the reservation) to prevent any type of partying or more guest than what is allowed. 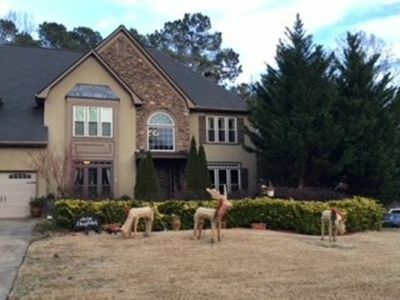 Welcome to Kim and Bill's Savannah suite in Kennesaw Georgia just north of Atlanta. We offer treetop living in the foothills of the north Georgia mountains. Come see what true southern hospitality is all about. The sleeping quarters includes a very comfortable double bed with television, cable and a Sony Play Station 3 connected to the Internet and includes Netflix and an assortment of PS3 games. A private bathroom with shower is just steps away. The office space includes a computer with fast broadband Internet connection. Guest Access Our one bedroom with office space offers a private coded entrance separated from the rest of the house. The common areas include a screened in porch fully furnished. The back deck is overlooking the trees with our unique hobbit style free-form patio furniture. Other amenities included are the ancient ruins of Pachu Mechu complete with sacrificial fire ring (wooden logs only please). Interaction with Guests We respect our guests privacy but are available a phone call or text away. The Neighborhood We are located in a modern 10 year old neighborhood tucked away from the main roads Getting Around Uber and bikes available Other Things to Note We have a Yamaha jet boat (seats 10), available for 1/2 day and full day cruises on Lake Allatoona. It comes with Capt. Bill as your tour guide. We are within 1 mile of a Publix grocery store, Walgreens drugstore, Noonday park/green space (bikes available), liquor store, Interstate 575 and Interstate 75 and Kennesaw State University. We are within 5 miles of Walmart Town Center Mall, Target, restaurants and Kennesaw Mountain. Landmarks include Kennesaw Civil War Battlefield, the Big Chicken, White Water and Lake Allatoona. Perfect for the Super Bowl! 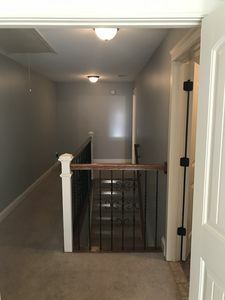 2nd Floor of New Home. 2nd Floor of our New Home, construction finished Nov. 2018 - TV Loft Area, Wet Bar, Mini Frig, Coffee Pot, 2 Bedrooms (1 King, 1 Queen), 2 full Baths. Driveway parking available for 2 vehicles. 29 miles to Mercedes Benz Stadium/ downtown Atlanta. Easy Highway assess 1 mile from home, perfect Super Bowl accommodations - don't hassle with a hotel, make yourself at home in this modern farmhouse. Tankless hot water heater, ceiling fans, flat screen TV, highspeed wifi. NO SMOKING! 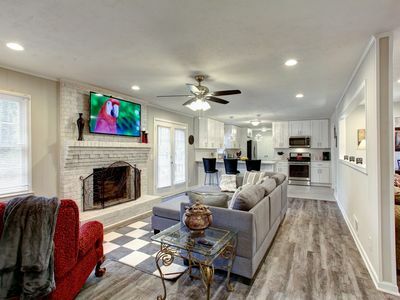 We recently finished the lowest level of our home into this awesome private living space! Starting with finished concrete floors, a dining area with full kitchen, counter top electric stove, microwave oven, apartment size refrigerator with top freezer, plenty of cabinets and counter space. 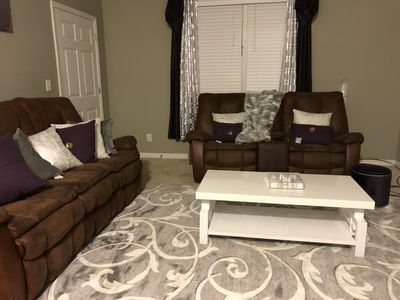 Comes furnished with a comfy couch that can be surfed, lazy boy recliner, 55" flat screen tv (includes Directv Netflix HBO and you can hook up your laptop to the HDMI 2 input). Sleeping arrangements start with the "pull down from the wall" Murphy bed (Queen size) sleeps two. Comfy couch will sleep one and a double size air mattress sleeps one. Large bathroom with dresser/mirror, shower and vanity. Private Key-pad door entry for safety and convenience. Slight hike down the hill to the gate. This is the perfect getaway spot for folks who just want to chill and relax for a few days, a week or a month. We are also 15 minutes away from Lakepoint Sports Complex. Big enough to host a family reunion, but cozy enough for a romantic weekend with your honey. Each room has its own décor theme, the master suite is INCREDIBLE, and the house has plenty to keep you entertained like pool, games, and dish network. We have worked hard to make our home your home.